I have decided to open a thread for the upcoming EU copyright guideline because it is immensely important for the internet that we fight against it. The Directive is intended to modernise the copyright laws so that they are better adapted to the Internet. Any platform that commercially uses the content of another author must pay to this author. For example, if you use Google to search for news, Google must pay to this news page so that it can display text snippets in the search results. You could compare it like this: A car manufacturer wants money from fuel manufacturers, because these fuel manufacturers profit from the fact that cars of the car manufacturer need their fuel. This is nonsense, because news sites benefit massively from being found on search engines themselves. There would only be losers with such a law. Any commercial platform where users can upload things (texts, music, pictures, videos) is directly liable if one of these things violates the copyright. Until now, the user was responsible. Article 13 requires the platform to actively prevent such content from being uploaded. This is called an upload filter. This is disastrous for the Internet, since platforms prefer to engage “overblocking” rather than being legally vulnerable. And from YouTube filters we already know these filters have flaws. Algorithms will be like “Guilty until proven innocent”. Why should non-Europeans care? Why should Hitmanforum care? The Internet is getting a little darker without Europe. Europeans who upload their Hitman stuff need to use non-EU websites, excluding big US sites like YouTube as they are too big to not be affected by EU laws. Neither Jar as the forum owner nor the forum itself is european, so the effects on Hitmanforum will be little. If it was different, HMF has to check every post Europeans make before making it readable for others. Luckily this is not the case. Still if you are an European you will be affected as explained above, especially if you are using Social Media like Facebook. Maybe also with Twitter and Reddit. Contact your EU MEPs. Find out which of your national parties have which position. Inform other people, maybe use your YouTube channel if you have one. Stick to the subject. Organize demonstrations. 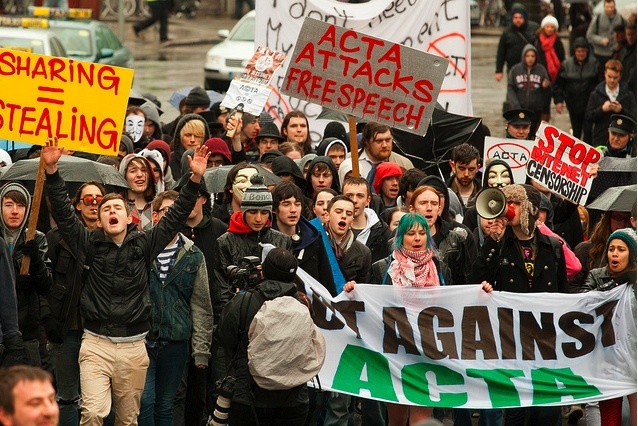 As a reminder, ACTA was also prevented at EU level in 2012 thanks to mass protests in winter. (Hands up who was there ) And the guideline is way more dramatic in its effects than ACTA was. Follow your local digital rights group. Every country has atleast one of them. Internationally there is the Electronic Frontier Foundation, which comes from the USA but also invests a lot of energy in the topic. In two weeks, around the 4th of July, the whole European Parliament will vote if the draft has to be changed. So it is already time to write to your MEP to object the two articles. We might have a better draft then at the year’s end without upload filters and link tax. Updated the demonstration list, poland is rocking it again this time, just like back at ACTA! 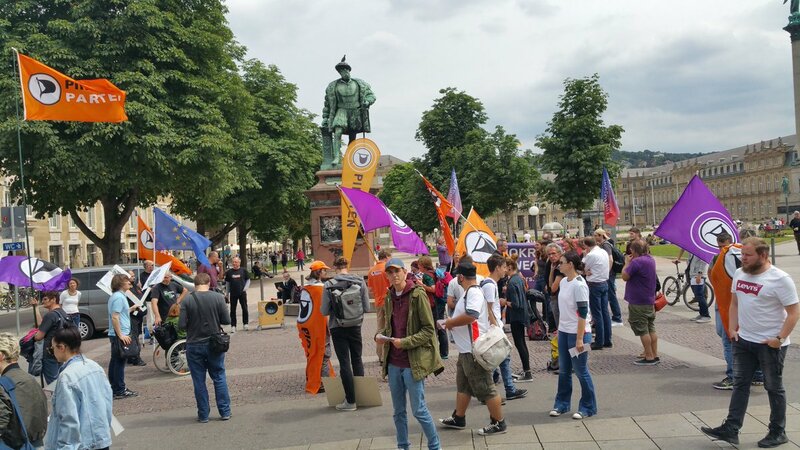 Meanwhile, here some picture of Berlin + Stuttgart last weekend. Not many but I feared it will be less as they called for it just a few days before. Not today but tomorrow the whole European Parliament will vote on the copyright reform. If they vote ‘yes’ there wont be much changes and a final vote will be around September. This would be bad because the reform includes good aspects as well. It will be harder then to make the majory of the parliament toss the whole thing because of Article 11&13. If they vote ‘no’ the bill will be opened again for major changes. The chance then is much higher to get rid off Article 11&13 without tossing the whole thing. After this, around Dezember/January there also will be a final vote. Some Wikipedia sites shut down their access to articles in protest. Like the spanish, polish and the latvian versions. Pretty much every netpolitician in every European party is against it, but naturally they have not that much influence. So far Poland, in which a few thousand people went to protests the last week, it’s government will vote for ‘no’. Same with Sweden and the Czech Republic. In every other country opposition parties more or less said they will vote ‘no’ as well. But still it is unknown if this is enough. We will know tomorrow! The proposal got rejected. It will be opened for major changes. Yay! So just be to clear, there will be no article 13 in its current form? This is now up to the parliament. They actually can even make it worse. Basicalle today’s vote was: “I am for the reform in this form” or “I am against the reform in this form”. So also MEPs who think the Internet should be shut down at all would have voted against this reform, because it is not extreme enough. But I guess there are now many MEPs aware of what the people criticize and will put good changes to the vote in September. Protest has to go on atleast to this point. Germany will have some events too but the planning phase is still going. Same with other EU states. This time we dont have just a week to come up with something so the 26th of August might turn out bigger and more well planned. 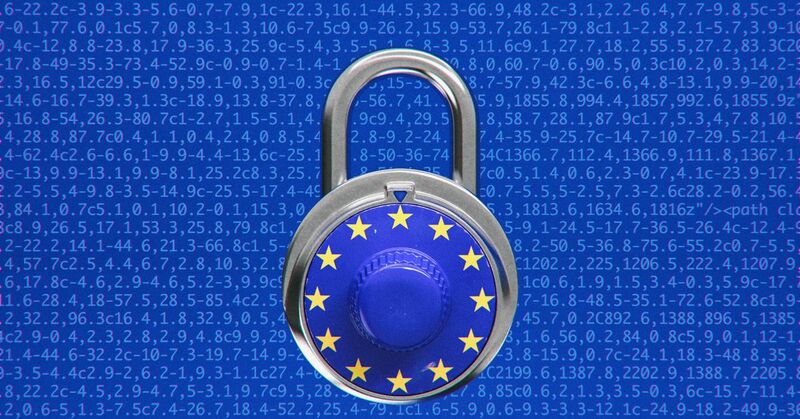 The European Parliament will decide which direction the copyright reform will take around 10th to 13th of September. So it is needed to give them some more pressure until then! A little update, the number of demonstrations on the 26th is increasing. 5 in Poland, 5 in Germany, 4 in Austria, 2 in Sweden, 1 in Finland, 1 in Slovenia, 1 in the Czech Republic, 1 in France. You’d do yourself and the Internet a favour if you visit a demonstration at your area. Still some of them have their details yet to be announced, but surely this will happen the next days. 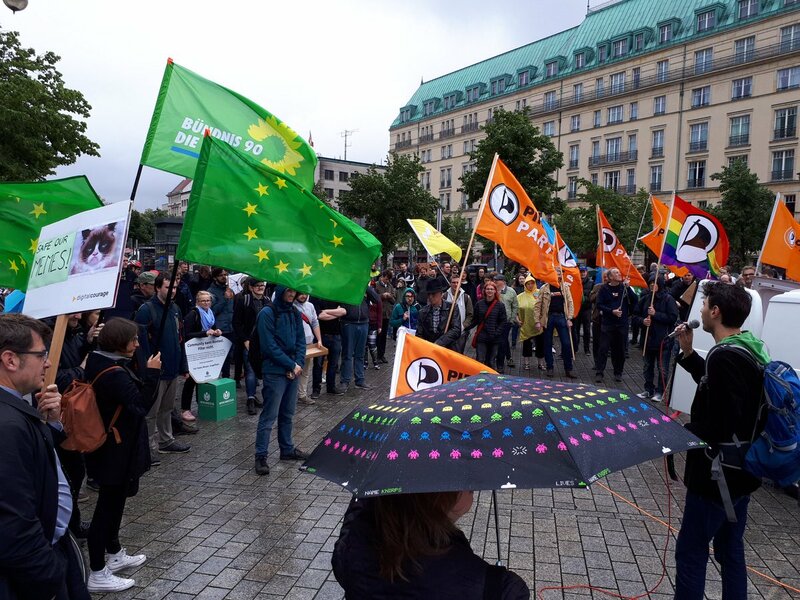 Especially french people should consider to support the protest because their weight in the parliament is big and the last vote made visible the majority of MEPs is for the copyright reform. The petition on change org is close to 1 Million. Although I dont want to share it because I dont think the site is legit. Still it shows how much support the protest is having. EDIT: Oh and the summer break of the European Parliament will end on the monday after the demonstration day. So the first day of working on the reform will be the day after the strong signal from us users. I think so. But still UK MEPs are part of the parliament and are discussing and voting for this matter. Looks like all have the exact details. Get there! The demonstrations are over (except Portugal who seem to demonstrate in September) with roughly 750 Europeans being on the streets. Not many sadly. Roughly half of them were in Germany. The European Parliament began it’s work yesterday and is now the politicians have time to add Amendments until September 5th and the final vote will be on the 12th at noon CEST. 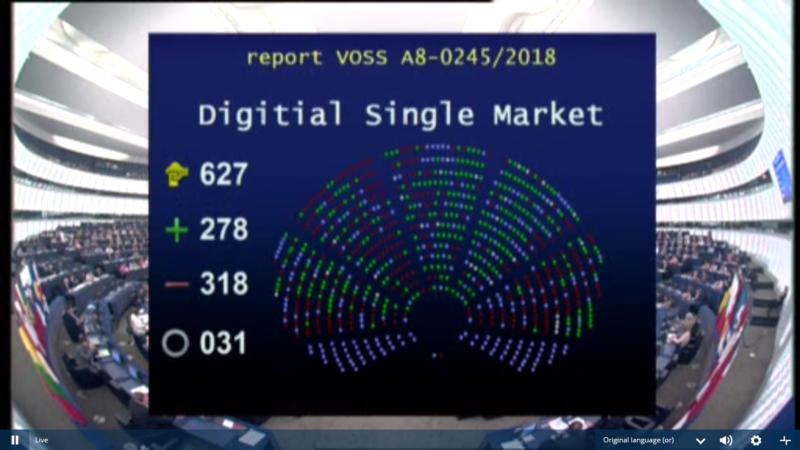 The EU parilament just voted in favor for Article 11 (Linktax) and Article 13 (Uploadfilter). There were multiple amendments of the articles on the table and they voted for the worsts of them. Thanks for keeping us informed on all of this, @Urben, but as you say, this marks a very sad day indeed. I hope you guys atleast benefit from the Brexit in that regard. Being a Brit depresses me now.